The Optoma 4K500 is a high performance 4K installation projector that uses the same 4K UHD DLP chip found in Optoma's aggressively priced home theater projectors, the UHD60 and UHD65. Compared to those projectors, this one is designed for versatile commercial presentations in ambient light, so it pumps out 5000 lumens at a lower contrast. The Optoma 4K500 is built to deliver razor sharp text in PowerPoint presentations and Word documents as well as cinematic video in a variety of large venues, meeting rooms, houses of worship, and post production screening rooms. 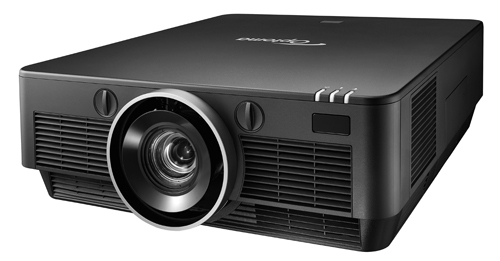 As with many Optoma projectors, the 4K500 is aggressively priced in comparison to other 4K installation projectors on the market. Its list price of $6,999 is much lower than competing 4K projectors in part due to the use of a lamp-driven light engine as opposed to LED/Laser. Yes, you may need to replace the lamp on occasion, but when you see the price difference between the 4K500 and its 4K competition, you'll probably discover you can replace a lot of lamps for the extra money you'll need to pay up front for the alternatives. The Optoma 4K500 offers motorized zoom and focus and both horizontal and vertical lens shift for easy installation and image adjustment. The projector will fill a 180" diagonal 16:9 screen from a throw distance of about 18 to 34 feet. If your screen is something different than 180" diagonal, see the Optoma 4K500 Projection Calculator for various throw distances and screen sizes up to 300". In short, if you've got a medium/large venue ambient light application that demands 4K precision and you don't want to spend a lot of money, the Optoma 4K500 was designed with you in mind.